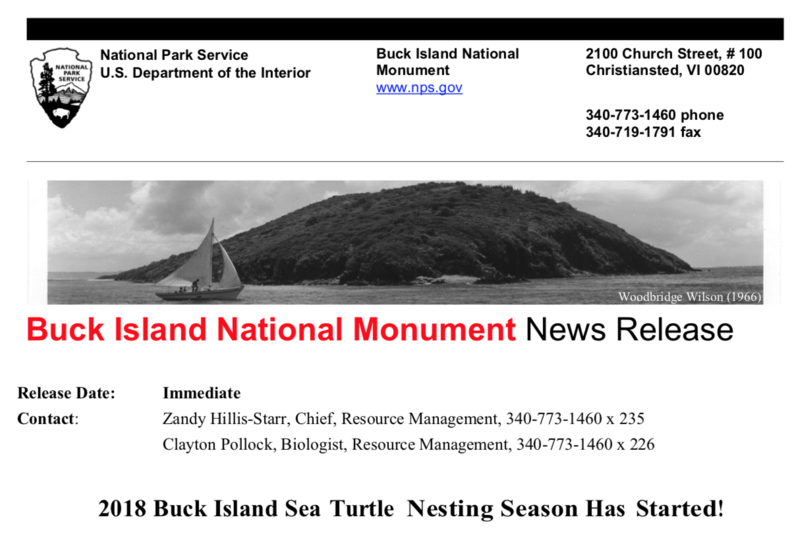 The National Park Service celebrates its thirty-first year of research on the seaturtles nesting at Buck Island Reef National Monument. The National Park Service along with ourpartner agencies (U.S. Fish and Wildlife Service, USVI DPNR Division of Fish and Wildlife, VICZM St. Croix East End Marine Park, and The Nature Conservancy) would like to take this opportunity toinform the public about sea turtles and the special consideration we need to give them while they are here in our islands to nest on our beaches. The nesting season for Virgin Island sea turtles (leatherback, green, loggerhead, and hawksbill) begins in March and continues through December of each year. There are several key nesting areas on St. Croixincluding Buck Island Reef NM, USFWS Sandy Point NWR, St. Croix’s East End Beaches – Jack’s, Issac’s, and East End Beaches, Southgate, Coakley Bay, and Hay Penney Beach on the south shore. Nearly ALL beaches, however, on St. Croix are utilized by nesting sea turtles! Beaches on Buck Island Reef NM will be patrolled nightly to protect nesting turtles and to continue long- term research on these endangered sea turtles in the US Virgin Islands beginning July 21st and will last into October. As a reminder Buck Island Reef NM beaches are closed to visitors after sunset till sunrise. All boats overnighting at West Beach Anchorage will have to confirm overnight permit with NPS Law Enforcement prior to stay. Please contact 340-773-1460 or 340-277-6794. Protected – all sea turtles are protected throughout the U.S. Virgin Islands under the U.S. Endangered Species Act. Beach users need to closely follow all regulations, especially pertaining tobeach fires, dogs, no digging in dry sand and never use tent stakes. Violations are subject to prosecution under civil and criminal laws and charged heavy penalties. Drive Slow – boat operators should drive cautiously; sea turtles rise slowly to the surface to breathe, and it takes them several seconds to dive to safety when they hear an approaching motor boat. Shield Lights – bright lights along beaches will disorient nesting adult sea turtles and hatchlings.Coastal property owners are encouraged to modify/shield or discontinue use of outdoor lights. Keep your distance – do not interfere with nesting or hatchling sea turtles; observe from adistance. Do not use flashlights or flash photography. The National Park Service thanks all of our community members and friends for 50 years of support forBuck Island and look forward to an exciting year of events celebrating our unique Virgin Islands’ resources.